On a cold Saturday afternoon we welcomed friends, family, customers and style enthusiasts from far and near to Götrich on Linnégatan. Perplexed as to what we should call such an event, let’s settle for Grand Opening. "Several exciting new things have happened in the last few months." Admittedly we’re not talking about an ”opening” per se, since the Götrich tailoring business has been running non-stop since the 1700’s. But, as many things stay the same – the craft, the style and the un-changing refusal to compromise with quality, several exciting new things have happened in the last few months. In December 2017 the shop changed owners. With the change of ownership came, among other things, a much needed renovation of the shop. Therefore we decided to invite old and new friends, and family, to celebrate the ushering in of a new era in the 300-year-old history of Götrich bespoke tailors. And, of course, to toast in Billecart Salmon’s fantastic bubbles – courtesy of Lively Wines. Soon after opening, the store was already brim packed with guests. 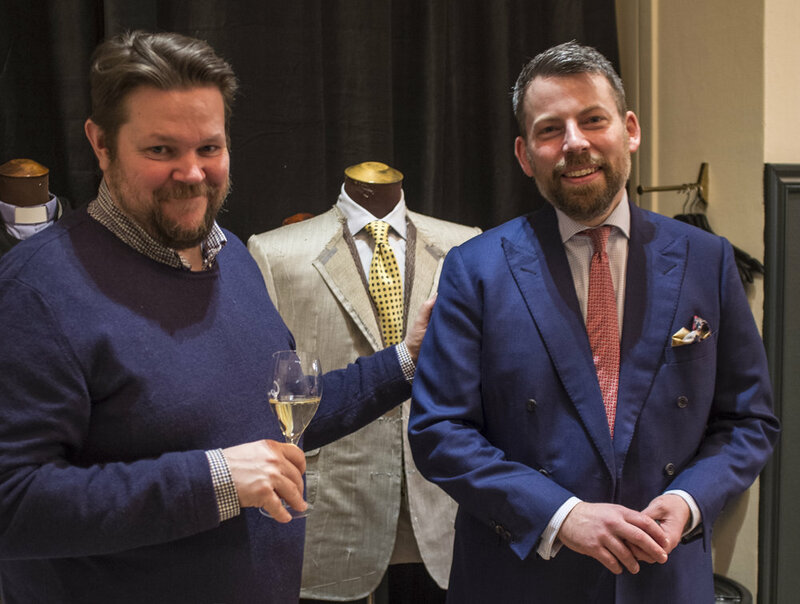 Always stylish Douglas Köhlqvist with one of Götrich new co-owners – Jocke Hartzell. Style enthusiast Jesper Brännström in a conversation with Götrich manager Jussi Häkkinen. The illustrator and musician Stefan Kayat with co-owner Erik Mannby. Champagne and rosé from Billecart-Salmon/Lively Wines. Co-owners Jocke Hartzell and Simon Berg. Fashion entrepreneur and model Pelle Norén in focus. Co-owners Erik Mannby and Simon Berg with Micaela Zilén and Tobias Skogquist from Shirtonomy. Stylish Måns Nelson of Lund & Lund. The elegant guests Eric Langenskiöld and Robert Ström. Robert Ström, Marie Mellgrim and Erik Mannby. A very happy Johan Wiklund. Well, we had a 99% success rate of happy guests. You can’t win ‘em all. Jocke Hartzell and Tobias Skogquist looking through cloth bunches. Jussi taking Nabil’s measurements for a new pair of bespoke trousers. James approves. Johan Wiklund and Rosette Hirsch of Plaza Publishing. MP Johan Hedin and Jocke Hartzell. 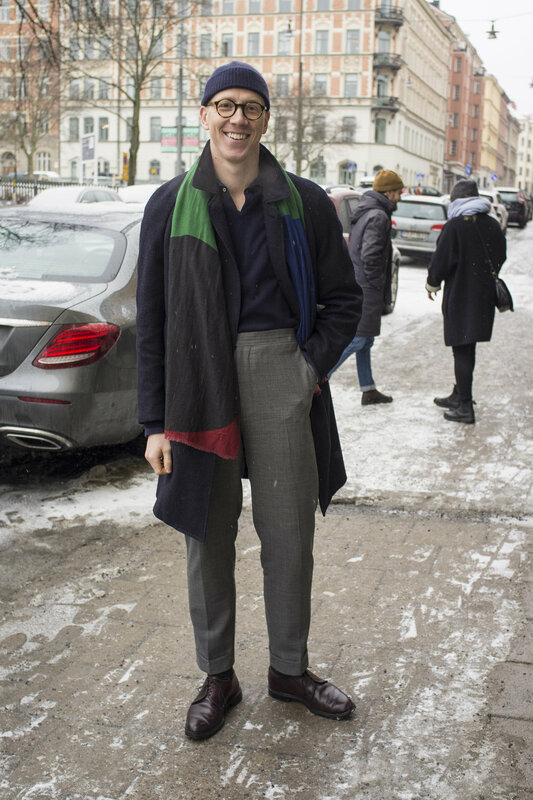 I think we dare say Jens Mattson is the most stylish Director-General in Sweden. Style entrepreneur and TV host Fosco Giulianelli. Andreas Larsson of Berg & Berg. Wine aficionado and entrepreneur Eric Edlund. Part of the Götrich team, from left to right: James Sleater, Jocke Hartzell, Simon Berg, Jussi Häkkinen and Erik Mannby.